Sweet shrub Carolina allspice grows in thickets throughout the Appalachians and the Smoky Mountain areas of the southeastern United States. Out in the mountains, you can easily come upon dramatic clusters eight feet tall and several feet wide where the Carolina allspice has taken hold. Native to North Carolina, this easily grown shrub produces a wonderful fragrance that perfumes the entire yard. Gardeners know sweet shrub Carolina allspice (Calycanthus floridus) by many names. Common names include sweet shrub, strawberry bush, Carolina allspice, sweet shade and bubby blossom. The name bubby blossom may be the most interesting one of the lot. Legend has it that in the days before regular baths and deodorants, women placed Calycanthus floridus blossoms in the bodice of their dresses, giving rise to the flowers' nickname of bubby blossoms! Don't confuse the Carolina allspice shrub with the allspice plant,used to flavor foods. The shrubs' berries are poisonous in large quantities, so stick with buying allspice at the store to ensure you're cooking with the food spice. While Carolina allspice blossoms may be strawberry-colored, and a nickname for the shrub is strawberry shrub, it is not related to the strawberry plant that produces sweet fruits in early summer. There are two related species of Calycanthus. Calycanthus floridus, the Carolina sweet bush or Carolina allspice, grows as far north as Ohio and Pennsylvania, and all the way to the deep south of Mississippi. 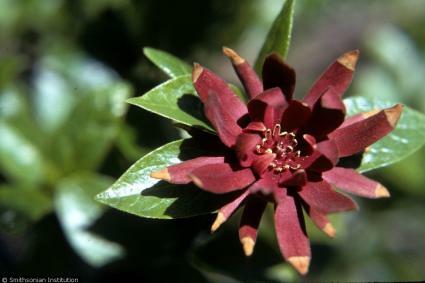 Those living in Oregon, Washington and California may be familiar with another related variety, Calycanthus occidentalis, or California sweet shrub. While the two are related, Calycanthus floridus is the one most gardeners know as sweet shrub Carolina allspice. Carolina sweet shrub is noted for its delightful fragrance. The entire plant is fragrant, from leaves to flowers. If you rub your fingers across the leaves, you'll detect the spicy aroma. When the flowers burst into bloom, the scent fills the air. Sweet shrub grows quickly. It usually attains a height anywhere between four to eight feet tall, with a spread of several feet. If you're planting several Carolina sweet shrubs, space them at least four feet apart, preferably eight to ten feet, to give them plenty of room to grow. Blossoms of the Carolina allspice or sweet shrub appear in mid spring, and quickly burst into bloom. The shrub will continue blooming throughout the spring and even into the summer. Colors include deep, rich shades of burgundy, maroon, and bronze. Although the flowers aren't particularly showy, the deep, rich, spice fragrance makes them worthwhile. Carolina allspice will quickly spread if conditions are right. You can easily pull up seedlings and give them away to neighbors and friends, or transplant them to other areas of the garden to enjoy them elsewhere. It may be too invasive for some people's tastes, but others enjoy having plants that spread out in the garden. Carolina sweet shrub is perhaps one of the least fussy shrubs to plant in the garden. If you live anywhere from zones 4a to 9b, you can easily grow it in the yard. It grows well in partial shade to full shade. Carolina sweet shrub likes a neutral to mildly acidic soil pH, ranging from 6.1 to 7.5. Water Carolina sweet shrub only during times of drought, making sure to provide it with about an inch of water per week. Carolina allspice makes a wonderful foundation planting. Plant Carolina allspice near decks, porches or patios to enjoy the fragrance while relaxing. Its interesting foliage and flowers also provide beautiful spring and summer backdrops for shorter shrubs and flowering perennials. The shrub is also deer resistant, making it a perfect shrub to plant in areas troubled by frequent deer browsing. While no shrub is entirely safe from a hungry herd of deer, Carolina allspice is one of the few that deer generally won't touch. Calycanthus floridus is a protected shrub, meaning you can't dig it up in the wild and bring it home. It grows easily from seedlings, so plant it with confidence. You'll enjoy a beautiful shrub in no time at all. It's readily available through local nurseries and national plant sources online and by catalog. Certain parts of the shrub are poisonous if ingested. Although you may see it referenced as an herb, it is not the same allspice used for cooking. Don't tempt fate. Enjoy the shrub in the garden, and buy your herbs from commercial sources to ensure safety and quality.